Are you looking to create a family tree? 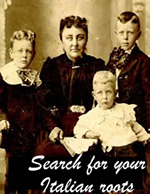 Searching for where your great-grandparents came from? Looking to obtain Italian Citizenship? Need to know if you’re eligible? No matter what you are seeking, Sentieri Italiani can help you with your search. Sentieri Italiani can help you trace your roots and find your family in Italy by putting you in touch with services specializing in research from your family’s region of Italy. Sentieri will happily assist with arranging a customized travel plan to visit your family’s home town and to meet your Italian relatives, and if you should need us to, a staff member will accompany you as your personal guide and interpreter. Sentieri Italiani offers expert translation of official documents necessary to apply for your citizenship. Sentieri’s affiliate “Italian Citizenship Assistance Program” or “ICAP” offers services for document procurement as well as general consultation on eligibility and the dual citizenship process. Why become an Italian citizen? Find out if you’re eligible for Italian Citizenship.